Like everyone else who listens to any amount of mainstream media on a regular basis, I heard the story of the racist kids from Kentucky wearing Make America Great Again hats and taunting a tribal elder in DC at the Women’s March. I tuned it out as a psyop immediately for numerous reasons. With stories like this I am often reminded of the scene in The Mission where the cardinal, about to order devastation upon the Indians in Paraguay, is rightly troubled by what he is set to do. His aide tries to comfort him by saying, “The world is thus, Your Excellency.” The cardinal replies, “Thus have we made the world.” Reports of obnoxious and overtly racist kids crashing the Women’s March wearing MAGA hats and attacking Native Americans are meant to convince us, “The world is thus.” I see how inorganically these incidents (to the extent they are ever accurately reported) have emerged and I think, “Thus have we made the world–are we making the world.” And I refuse to participate by engaging in the dialectical bait even intellectually. But the story did end up engaging me in the end…. At first the dialectic was “privileged white racist Trump supporting teenage boys menace peaceful Native American elder engaging in a call to prayer.” Not much of a dialectic really–who’s on the other side of that? The boys are not sympathetic–a dialectic has to have adherents on both sides to drive toward a pre-planned solution. (The dialectic is simply understood as Thesis-Antithesis-Synthesis or Problem-Reaction-Solution.) This wasn’t really a dialectic, just another pulse in the “Trump’s America Is a Racist America” meme. But then something strange happened. As other videos emerged, it became clear that the story offered by the Native American, Nathan Phillips, and his supporters, was false, and the media had accepted their narrative of this out-of-context moment with very little to go on but bias. No matter…as Saul Alinsky advised, if your original goal isn’t achieved, take the outcome as it is and turn it toward your own interests anyway. That is, you get lemons? Make lemonade. The story of the Racist Youth was quickly turned to the service of another meme: Suppressing Citizen Journalism and social media. The mainstream media, which is being held up to us as the only possible trustworthy curator of the news, is now claiming that even they are incapable of applying run of the mill journalistic standards to their sourcing and propagating “news,” and are crying out that they too must be protected from reckless off-poppers or outright disinformation agents on twitter. (In which case, I ask you, what gives them the claim as legitimate curators at all?!) Thus picking up where the Buzzfeed psyop–whose original purpose was to call into question that paragon of journalistic virtue–CNN–‘s ability to tell fact from fiction when implausible narratives credited to anonymous sources emerge–left off. Here’s what I think really happened…. The Right to Life march happens every year around the anniversary of Roe v Wade (January 22) in Washington DC. My mother used to take me down there as a kid and she remained an ardent activist for that cause well into her eighties and remains a single issue voter to this day, always giving her enthusiastic and undivided loyalty** to the politician who professes opposition to Roe v Wade and to public funding of abortion, even if that politician had previously been pro-abortion and will never actually do anything about abortion whether through lack-of-will or impossibility of circumstance. I realize now that’s why my mother–a New Yorker all her life–loves Donald Trump as president though she didn’t like him as a fellow New Yorker after he humiliated and left Ivana Trump, his wife and the mother of his children. Th Right to Life march gets undercovered and underestimated as a rule. Reminds me of when I marched on Washington against Obamacare–the news reports even on Fox estimated a fraction of the turnout I myself witnessed. I think this suppression is getting harder and harder to pull off and the Right to Life march keeps getting bigger and bigger. It won’t go away and it won’t be ignored. Enter the Women’s March. The Women’s March comes to Washington around the same time as the Right to Life march now–ostensibly first to coincide with Trump’s inauguration, or perhaps as my producer Binkley claims to commemorate the death of Vladimir Ilyich Lenin…I believe, however that the primary purpose is to counter the pro-lifers. To this end, antagonists and agents provocateur descend on the scene en masse looking for the most ardent of social conservatives–the subset of the pro-life crowd who actually get up and out in the January cold of DC year in and year out. The agitators look for anyone from this crowd to take the bait and they wait, iPhones rolling, to catch them in the act–never to reveal it’s actually the REact they are trying to catch them in. No matter…Facts are facts but truth is truth right? This I believe is what happened to the MAGA hat kids that day. A group called the Black Hebrew Israelites stood for nearly two hours straight, recording every minute of it, and hurled provocation after provocation, slur after slur, slander after slander, blasphemy after blasphemy, epithet after epithet to anyone and everyone within earshot, pretty clearly trying to get a rise. 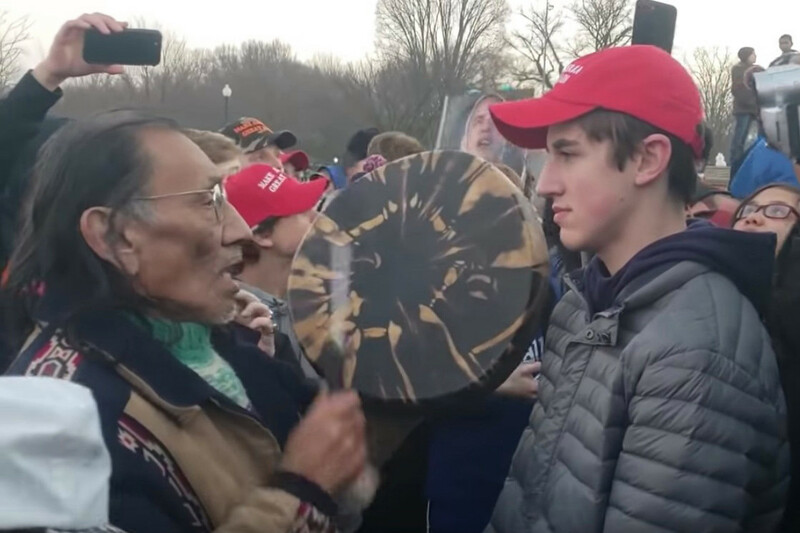 The MAGA hat kids emerged as the prime target around when one of the BHI called out to Nathan Phillips: “See the MAGA hats! See them!” or something to that affect. Phillips then waded into the crowd of boys, banging his drum and trailed by his videographer whose camera was within inches of Phillips’ face the whole time – clearly she was looking for the money shot. Yet through it all, those boys did not take the bait, even to the extent of defending their African-American classmates from the personal attacks of the BHI. Even “the smirking boy,” Nick Sandmann, makes it clear in a too-little too-late Today Show interview, he was doing everything he could not to disrespect this person by turning his back on him or reacting in any way that could be deemed offensive. The dialectic flips! But why is this entire Black Hebrew Israelite video available online? I’ve looked for many videos that have been scrubbed to no avail, yet this one is easy to find. Why even would BHI ever release it in its entirety? In my opinion, they released it to make more lemonade! The original divisive dialectic of identifying and calling out white racists didn’t work-but there’s no dialectic if there isn’t a polar opposite–now there are black racists to create the conflict and solidify in the mind of the country that we are each others’ enemies. As this occurred to me finally, I heard THE conservative talk show host say, in explanation of what really went on in DC that day, that it happened because “They have an unabated hatred of US!” Confirming my suspicions of why that video is out there. Perhaps this was the entire plan all along: Week One: White Racist Kids in Trump’s America; Week Two: What Is To Be Done about Citizen Journalism? ; Week Three: White America, You Are Under Attack! But my conclusion in all of this, the lesson I think was to be learned, will not dominate the headlines in Week Four, though it should. The most revealing fact to emerge from this story, is that there are agents provocateur, alleged activists whose sole goal is to bait people into extreme reactions and catch those reactions on tape. Reactions which can then be spun any way the provocateurs’ handlers like, but always as an indictment of a larger group or a bigger problem, the evidence of which needs to be manufactured since it is not actually there. These individuals and groups are there to provoke people, to incite conflict and to misrepresent the state of the world. What’s telling about this particular story however, is how real these provocateurs are, how determined, how orchestrated–but most of all how damaging not just to the society they are hoping to disrupt but to individuals who will actually get hurt. This is very dangerous and is heading for worse if we don’t see it for what it is. Look at the Maidan in Ukraine and protests during the so-called Arab Spring in Syria. Agents provocateur created the impression that both the governments and the protestors were deadly violent when in reality neither were. Another disgraceful aspect of Operation Divide and Conquer is that people of color are being exploited as agents of conflict by the tyrants who are fomenting and will gain from the chaos and injustice they sow. The only thing to fear is fear itself, however, in that this doesn’t call for new laws or regulations, just the enforcement of existing law. Our system, flawed though it is, is highly effective in the protection of individual rights if we identify it, use it and adhere to it. Nick Sandmann for example, got himself a helluva defamation lawyer. The question that remains not only unanswered but unasked until now, though, is how the harassing behavior of the BHI was allowed to go on for hours? Pathocracy at its finest, I suspect! **Oh, so why were the kids wearing MAGA hats? Because prolifers are single issue voters with absolute loyalty to the prolife candidate who Trump laughably is. They bought the hats in DC that day, in the spirit of their march. Who Is The Naked Man? The Episode YouTube Banned: Take a Listen – Do You Think I’m Bullying The Sheriff? I’ll be on an AFF panel at Hudson Grille on April 26 – You’re Invited! Are you a Truman? What's a Swenson?